Business Office Director performs a diverse range of administrative and supervisory tasks relating to the business office. Even though the job designation or title of these directors may vary, the roles and responsibilities that are executed revolves around the following – ensuring smooth business office operations, creating and documenting all filing system, supervising and training employees, conducting interviews, evaluating employee performance, interacting with customers and ensuring that the operations are executed to meet the business goals. 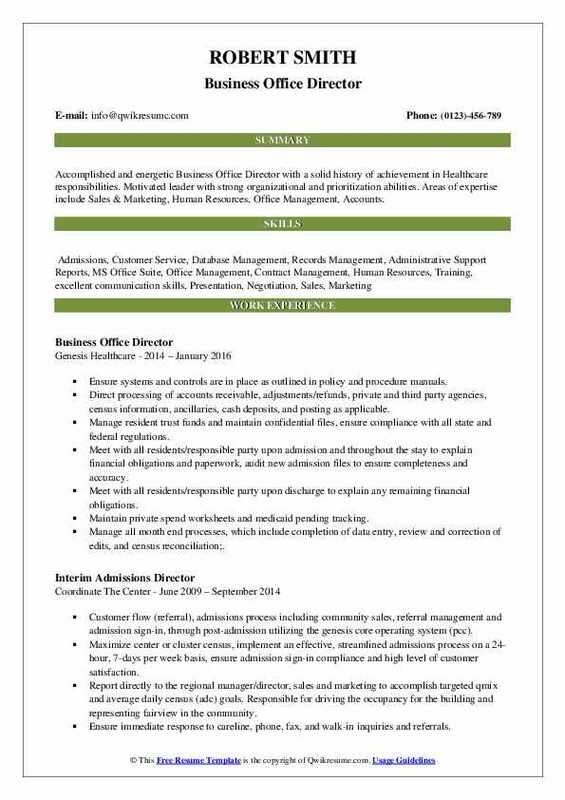 A Successful Business Office Director Resume highlights skills such as proficiency in office administration, hands-on experience with all office equipment, familiarity with email tools, excellent time management skills, MS Office proficiency, in-depth knowledge of business best practices and functions, working knowledge of data analysis and familiarity with the business software. A college degree in the related field is considered mandatory, however, prior experience and a Master’s degree is a huge plus. Headline : 5+ years of professional with proven office management success, Multi-tasker, Organized and detailed oriented with problem solving ability, Adept at implementing procedures to increase efficiency and productivity levels. Performed human resource administrative duties for the property, including payroll, maintenance of personnel files and facilitating general employee issues and inquiries as directed. Recruited, hired, evaluated, coordinated, motivated, monitored performance, scheduled and supervised business. Responsible for posting new job positions for the property and placing appropriate help-wanted. Responsible for all aspects of employee orientation including development and conducting such training. Managed employee benefit program including the notification to employees of eligibility requirements. Informed the executive director when its time to conduct staff evaluations, merit pay increases, reprimands, disciplinary actions and terminations. Ensured that disciplinary action is administered fairly. Consulted with department directors concerning and assisting in eliminating/correcting problem areas and/or improvement of service. 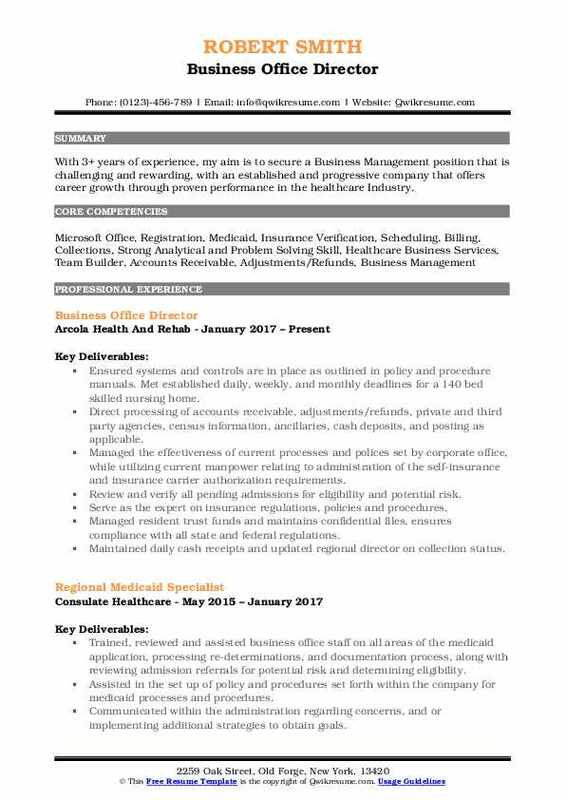 Summary : Highly experience Business Management professional, Offering solid knowledge of contract review, regulations, policies and procedures (in healthcare, local and government laws), combined with the drive, leadership and tenacity necessary to work with an array of departments and entities. Built strong client relationships and follow through on opportunities to strengthen relationships that represent the highest standards of business and professionalism. 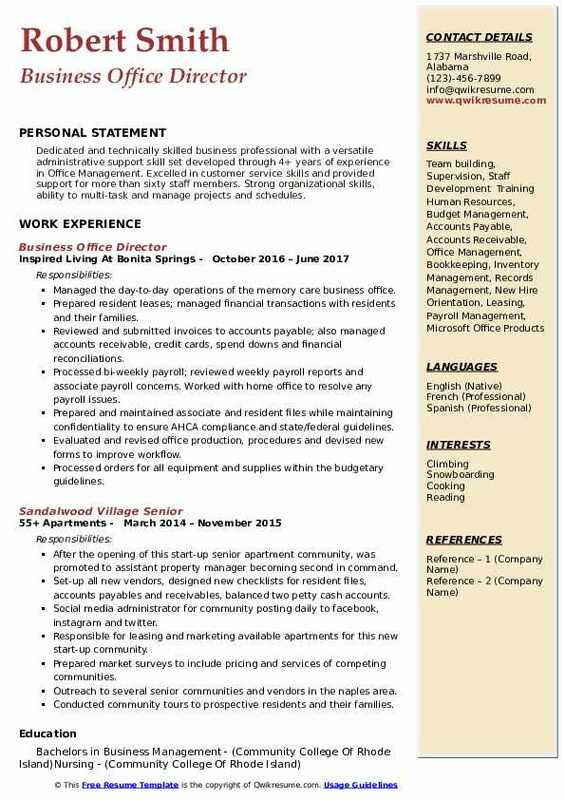 Skills : Office Management, Contract Management, Proof Reading, Human Resources, Training, excellent communication skills, both orally and written, Evaluative Methodology and Techniques, Presentation, Negotiation and Closing, Revenue Cycle Management, Customer Service, MS Office Suite, HMS (MedHost), SSI, Cobius, Meditech, and Novell. Experienced leader able to negotiate with decision makers across internal divisions and external healthcare. Reviewed, created, and managed, long-range plans, goals, and objectives of a variety of healthcare departments and agencies. Assigned projects, set and adjusted short-term priorities, and prepared schedules for completion of work by subordinates. Ensured that work is assigned to subordinates based on expertise level, outstanding priorities, selective consideration of the complexities anticipated, and special requirements of assignments. Provided technical and administrative directions to subordinate staff. Directed and supervised the work of the office, approved leaves, developed unified positions, developed performance standards, evaluated work performance, approved raises and bonuses, resolved group grievances. Provided training, mentoring, and coaching to subordinate staff with regard to career development. Maintained effective contacts and acted as a liaison with members of the public or outside agencies (local, federal, and state) in order to convey detailed information about policies, contracts, and finances, facility changes. Extensive knowledge of healthcare contract review, regulations, policies and procedures at the local, federal, and state levels. 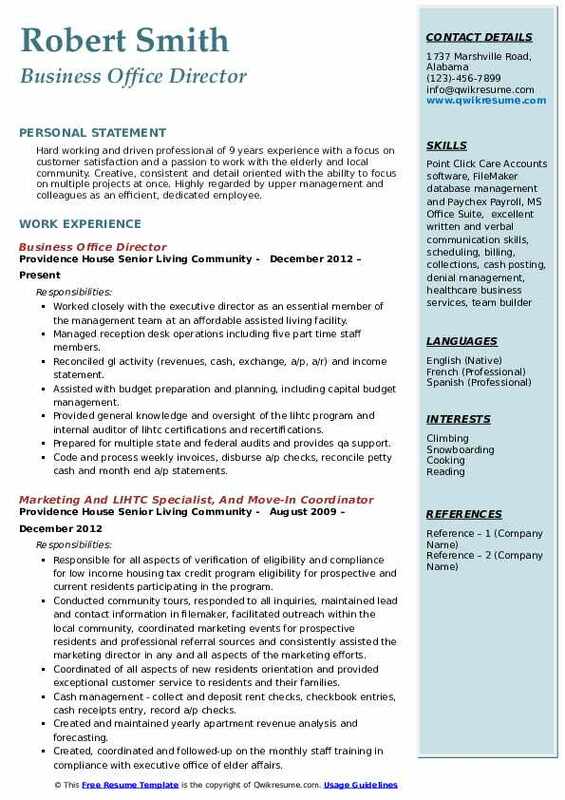 Primary manager responsible for reviewing, creating, editing, and finalizing contracts. Excellent comprehension of finances and financial transaction, law, contracts, confidentiality, for profit and non-profit organizations. Processing excellent communication skills, both orally and written. Skilled in proofreading and editing documents, both personal and those drafted by others. Skilled negotiator, regularly interacting with attorneys. 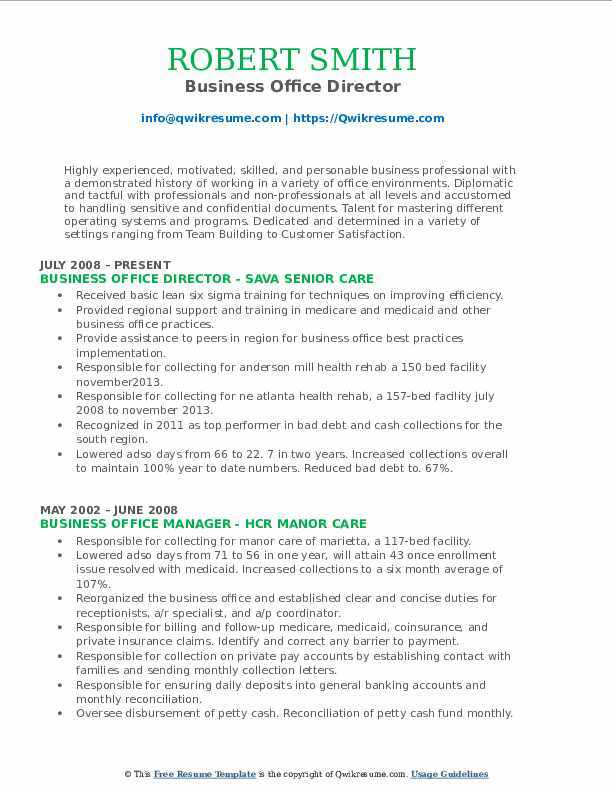 Summary : Accomplished and energetic Business Office Director with a solid history of achievement in Healthcare responsibilities. Motivated leader with strong organizational and prioritization abilities. Areas of expertise include Sales & Marketing, Human Resources, Office Management, Accounts. Ensure systems and controls are in place as outlined in policy and procedure manuals. Direct processing of accounts receivable, adjustments/refunds, private and third party agencies, census information, ancillaries, cash deposits, and posting as applicable. Manage resident trust funds and maintain confidential files, ensure compliance with all state and federal regulations. Meet with all residents/responsible party upon admission and throughout the stay to explain financial obligations and paperwork, audit new admission files to ensure completeness and accuracy. Meet with all residents/responsible party upon discharge to explain any remaining financial obligations. Maintain private spend worksheets and medicaid pending tracking. Manage all month end processes, which include completion of data entry, review and correction of edits, and census reconciliation;. Manage accounts receivable collections for past due resident accounts; ensures timely filing of medicare, medicaid, and insurance claims;. Provide written past due report concerning resident accounts to the administrator, prepares for and attends a/r review meetings, documents collection activities. Recommend and prepare accounts for outside collection agencies, attorneys, and write off as applicable;. Supervise, organize, evaluate, and monitor business office operations. Delegate administrative authority, responsibility and accountability to other office personnel as necessary. 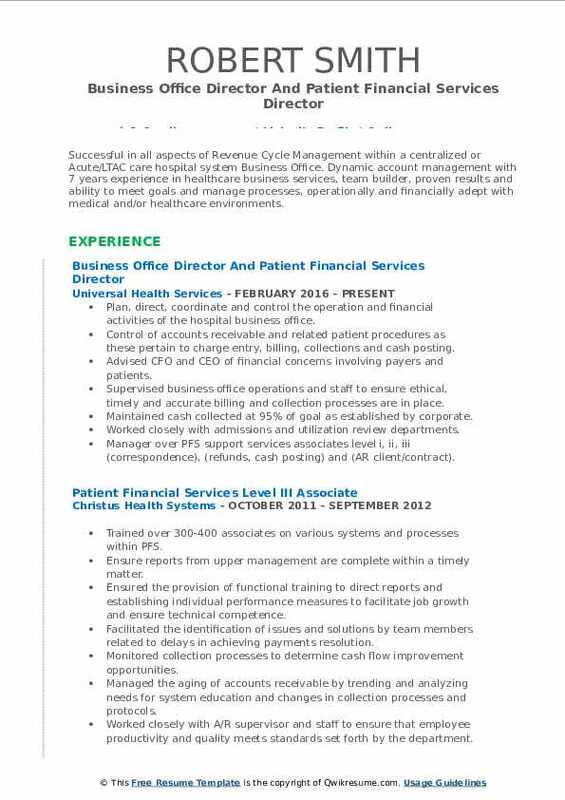 Headline : Successful in all aspects of Revenue Cycle Management within a centralized or Acute/LTAC care hospital system Business Office. Dynamic account management with 7 years experience in healthcare business services, team builder, proven results and ability to meet goals and manage processes, operationally and financially adept with medical and/or healthcare environments. Plan, direct, coordinate and control the operation and financial activities of the hospital business office. Control of accounts receivable and related patient procedures as these pertain to charge entry, billing, collections and cash posting. Advised CFO and CEO of financial concerns involving payers and patients. Supervised business office operations and staff to ensure ethical, timely and accurate billing and collection processes are in place. Maintained cash collected at 95% of goal as established by corporate. Worked closely with admissions and utilization review departments. Manager over PFS support services associates level i, ii, iii (correspondence), (refunds, cash posting) and (AR client/contract). Summary : Hard working and driven professional of 9 years experience with a focus on customer satisfaction and a passion to work with the elderly and local community. Creative, consistent and detail oriented with the ability to focus on multiple projects at once. Highly regarded by upper management and colleagues as an efficient, dedicated employee. Worked closely with the executive director as an essential member of the management team at an affordable assisted living facility. Managed reception desk operations including five part time staff members. Reconciled gl activity (revenues, cash, exchange, a/p, a/r) and income statement. Assisted with budget preparation and planning, including capital budget management. Provided general knowledge and oversight of the lihtc program and internal auditor of lihtc certifications and recertifications. Prepared for multiple state and federal audits and provides qa support. Code and process weekly invoices, disburse a/p checks, reconcile petty cash and month end a/p statements. Prepared/adjusted monthly statements to include reconciliation/input of all charges. 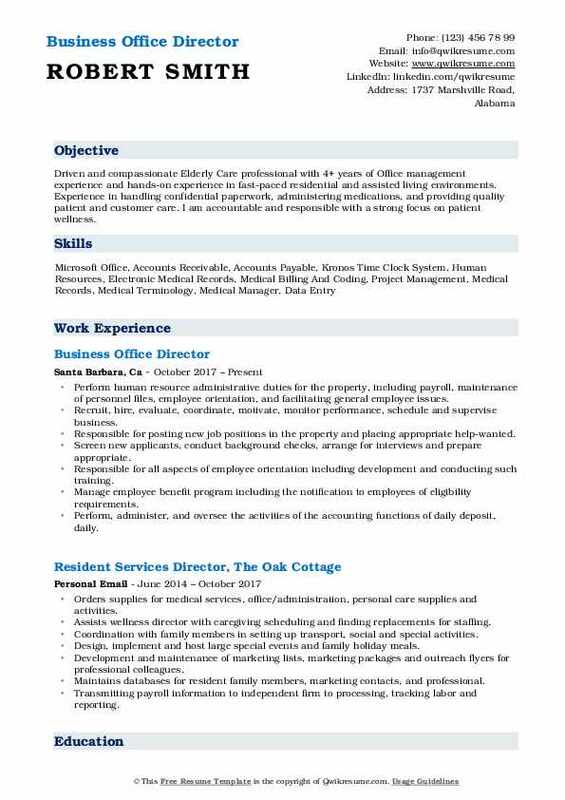 Objective : Driven and compassionate Elderly Care professional with 4+ years of Office management experience and hands-on experience in fast-paced residential and assisted living environments. Experience in handling confidential paperwork, administering medications, and providing quality patient and customer care. I am accountable and responsible with a strong focus on patient wellness. Perform human resource administrative duties for the property, including payroll, maintenance of personnel files, employee orientation, and facilitating general employee issues. Recruit, hire, evaluate, coordinate, motivate, monitor performance, schedule and supervise business. Responsible for posting new job positions in the property and placing appropriate help-wanted. Screen new applicants, conduct background checks, arrange for interviews and prepare appropriate. Manage employee benefit program including the notification to employees of eligibility requirements. Perform, administer, and oversee the activities of the accounting functions of daily deposit, daily. Census, accounts receivable/collections, accounts payable, and management reports. Responsible for accounts receivables and payables by ensuring that resident accounts are up to date. Ensuring Outside vendors are paid in a timely manner, and responsible for ledger management. Coordinate all payroll functions, including but not limited to confirming hours worked with,. Summary : Highly experienced, motivated, skilled, and personable business professional with a demonstrated history of working in a variety of office environments. Diplomatic and tactful with professionals and non-professionals at all levels and accustomed to handling sensitive and confidential documents. Talent for mastering different operating systems and programs. Dedicated and determined in a variety of settings ranging from Team Building to Customer Satisfaction. Received basic lean six sigma training for techniques on improving efficiency. Provided regional support and training in medicare and medicaid and other business office practices. Provide assistance to peers in region for business office best practices implementation. Responsible for collecting for anderson mill health rehab a 150 bed facility november2013. Responsible for collecting for ne atlanta health rehab, a 157-bed facility july 2008 to november 2013. Recognized in 2011 as top performer in bad debt and cash collections for the south region. Lowered adso days from 66 to 22. 7 in two years. Increased collections overall to maintain 100% year to date numbers. Reduced bad debt to. 67%. Reorganized the business office and established clear and concise duties and processes for my building as well as the region. Responsible for billing and follow-up medicare, medicaid, coinsurance, and private insurance claims. Identify and correct any barrier to payment. Responsible for collection on private pay accounts by establishing contact with families and sending monthly collection letters. Responsible for ensuring daily deposits into general banking accounts and monthly reconciliation. Oversee disbursement of petty cash. Reconciliation of petty cash fund monthly. 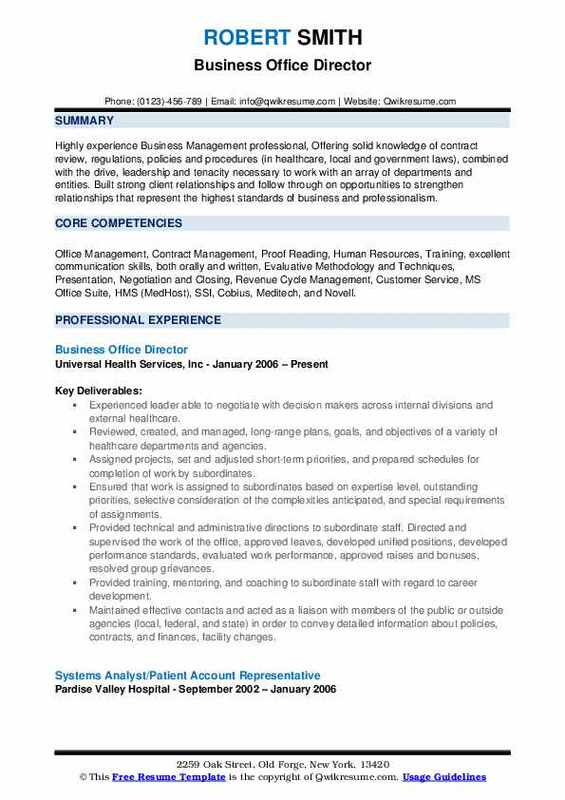 Objective : With 3+ years of experience, my aim is to secure a Business Management position that is challenging and rewarding, with an established and progressive company that offers career growth through proven performance in the healthcare Industry. Ensured systems and controls are in place as outlined in policy and procedure manuals. Met established daily, weekly, and monthly deadlines for a 140 bed skilled nursing home. Managed the effectiveness of current processes and polices set by corporate office, while utilizing current manpower relating to administration of the self-insurance and insurance carrier authorization requirements. Review and verify all pending admissions for eligibility and potential risk. Serve as the expert on insurance regulations, policies and procedures. Managed resident trust funds and maintains confidential files, ensures compliance with all state and federal regulations. Maintained daily cash receipts and updated regional director on collection status. Coordinated documentation for internal and external auditors. Assisted administrator and accounting dept with resolving G/I variances. 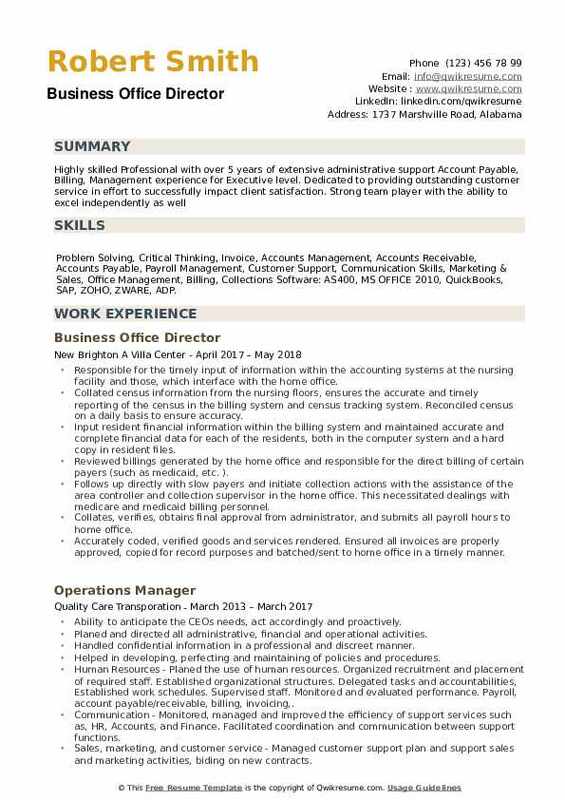 Objective : Dedicated and technically skilled business professional with a versatile administrative support skill set developed through 4+ years of experience in Office Management. Excelled in customer service skills and provided support for more than sixty staff members. Strong organizational skills, ability to multi-task and manage projects and schedules. Managed the day-to-day operations of the memory care business office. Prepared resident leases; managed financial transactions with residents and their families. Reviewed and submitted invoices to accounts payable; also managed accounts receivable, credit cards, spend downs and financial reconciliations. Processed bi-weekly payroll; reviewed weekly payroll reports and associate payroll concerns. Worked with home office to resolve any payroll issues. Prepared and maintained associate and resident files while maintaining confidentiality to ensure AHCA compliance and state/federal guidelines. Evaluated and revised office production, procedures and devised new forms to improve workflow. Processed orders for all equipment and supplies within the budgetary guidelines. Maintained administrative budget and provided reports to management as requested. Conducted orientations and assisted with training of new associates. Human resource contact for all associates. 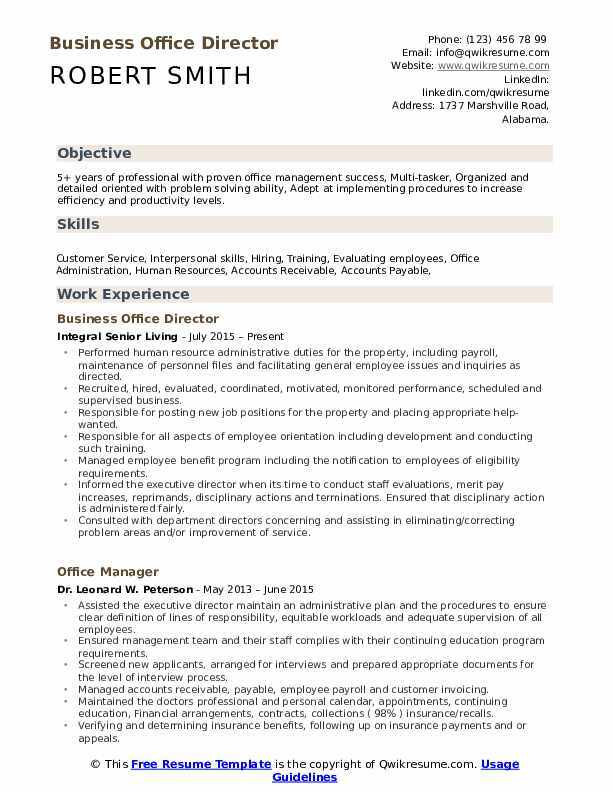 Skills : Problem Solving, Critical Thinking, Invoice, Accounts Management, Accounts Receivable, Accounts Payable, Payroll Management, Customer Support, Communication Skills, Marketing & Sales, Office Management, Billing, Collections Software: AS400, MS OFFICE 2010, QuickBooks, SAP, ZOHO, ZWARE, ADP. Responsible for the timely input of information within the accounting systems at the nursing facility and those, which interface with the home office. Collated census information from the nursing floors, ensures the accurate and timely reporting of the census in the billing system and census tracking system. Reconciled census on a daily basis to ensure accuracy. Input resident financial information within the billing system and maintained accurate and complete financial data for each of the residents, both in the computer system and a hard copy in resident files. Reviewed billings generated by the home office and responsible for the direct billing of certain payers (such as medicaid, etc. ). Follows up directly with slow payers and initiate collection actions with the assistance of the area controller and collection supervisor in the home office. This necessitated dealings with medicare and medicaid billing personnel. Collates, verifies, obtains final approval from administrator, and submits all payroll hours to home office. Accurately coded, verified goods and services rendered. Ensured all invoices are properly approved, copied for record purposes and batched/sent to home office in a timely manner.